There’s a vendor at my local farmer’s market who has the best apples on the planet. Seriously. I’ve never had an apple better than the ones he sells; in fact, I’ve never had an apple that even came close. Every year when he runs out of stock and disappears around New Year’s, I feel bereft. There are other places to get apples, of course, but it’s never quite the same. This year, I finally realized that I could solve that problem for at least part of the winter. Why it never occurred to me to ask about bulk buying before, I have no idea, but next week, lucky apple-nomming me is going to be the proud owner of a whole bushel of apples. That’s over 40lbs, and trust me, I’ll be lucky if it last me until February. While squeeing over this to a friend of mine, I happened to bring up the apple and cheese sandwiches I used to eat at a now-defunct local coffeehouse. I’ve recreated them in the recent past using the vegan grilled cheese from Everyday Happy Herbivore, and it’s a delightful combination. My friend mentioned that the only time she’d had apples and cheese together was when she ordered a pizza and the restaurant accidentally put apples on it. Of course, my brain immediately saw APPLE PIZZA and latched onto it like the rabid foodie I am. I knew I had to try it, and I had an evening this past week when I was only cooking for myself and had a bit of leeway to experiment. However, with school eating my life the way it has been, I didn’t want to take all the time necessary to make pizza dough and wait for it to rise. I needed another way to try out this concept. Having just received Isa Does It as an early Christmas present, I’d already tried the unique idea of a pizza bowl (which I swear I will blog about sometime), so I knew it was delicious. I did a little Googling to find out if in fact other people had made an apple pizza before and, if so, what else went well with apple as a topping. In the savory pizza recipes I came across, the universal constant seemed to be carmelized onions. And of course, every “the bowl” needs something green, leafy and inherently vegan, so kale wound up in the mix as well. To top it all off, I pulled out Appetite for Reduction and made some of the “Easy Breezy Cheezy Sauce,” which is one of my personal favorite vegan cheese sauces for those times when a cheddar-y flavor is warranted. Combine the rice and water in a small saucepan over high heat. Cover and bring to a boil, reduce the heat to low and simmer, covered, until the rice is tender and the liquid is abosrobed, 40-45 minutes. Remove from the burner and let stand for 5 minutes before fluffing with a fork. Place the onions in a large skillet over medium-high heat and cook, stirring frequently, until they begin to brown, 10-15 minutes. If necessary, add a very small amount of water to keep them from sticking to the pan. The goal is to caramelize them, and too much water will make them soggy! Don't walk away at this point, either, or you'll wind up with black crispy onions instead of nice brown ones. Add the apples to the pan with the onion, reduce the heat to medium and cook until the onions finish browning and the apples are soft, 5-7 minutes more. Add the kale and more water--it's okay to put a big splash in at this point. Stir until the kale starts to wilt, then cover and cook until completely wilted, stirring occasionally. How long this takes depends on your kale. Add more water if necessary. 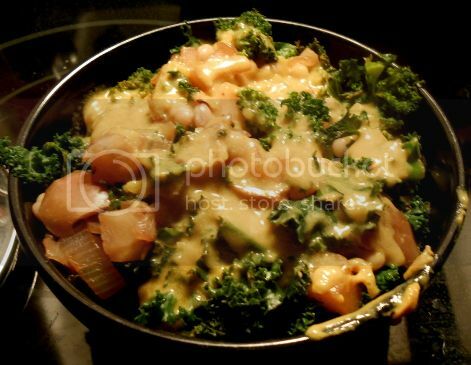 While the kale is cooking, prepare your "cheese" sauce. Keep warm until ready to use. Add the beans and more water if necessary and heat through, stirring occasionally. To serve, place ¼ of the rice in each bowl and top with ¼ of the veggie/apple mixture. Drizzle with "cheese" sauce and serve hot!